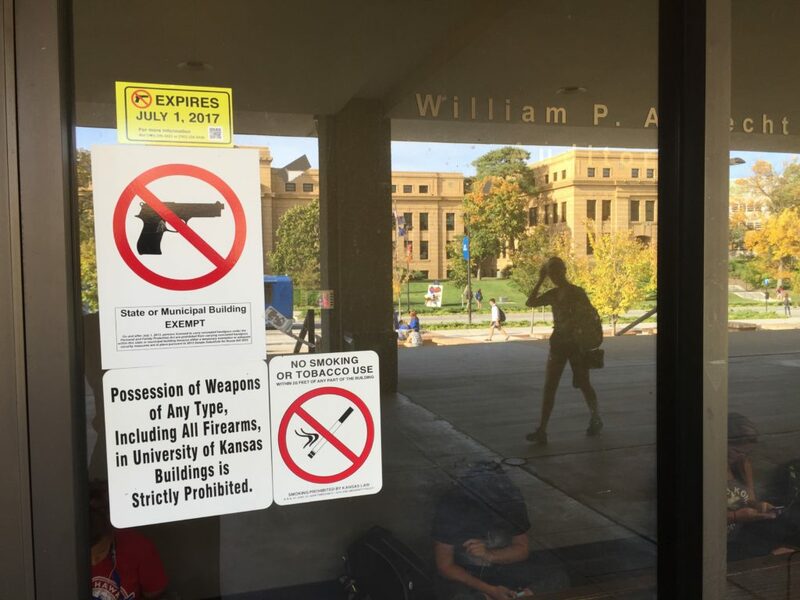 No guns allowed signs are posted on doors leading into Wescoe Hall on the University of Kansas campus on Monday, Oct. 17, 2016. Jayhawk Boulevard and Strong Hall are reflected in the glass. Elected representatives of faculty, staff and students at the University of Kansas are now formally on the record opposing campus carry. 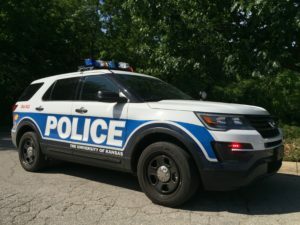 KU’s full University Senate this month approved a resolution, first crafted by the University Senate executive committee, stating that the body opposes “in the strongest possible terms” allowing concealed weapons on the KU campus. State university campuses currently prohibit guns, but Kansas law requires them to allow lawful concealed carry beginning July 1, 2017. KU and the other universities have been prepping for that date by crafting policies for implementing the new concealed carry law. 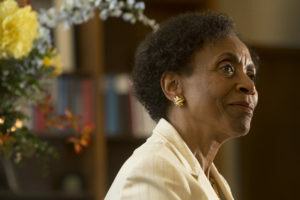 The Kansas Board of Regents is expected to approve draft policies from KU and the other schools on Wednesday. of the staff, students, and faculty. allowing concealed weapons on campus. In true academic fashion, faculty members from the six state universities are already discussing possibilities for studying effects of the law — whether they want it to become reality or not. The Regents Council of Faculty Senate Presidents is working on a survey to measure university faculty, staff and students’ anxiety about campus carry, according to a report at last month’s Board of Regents meeting. The idea is to establish a baseline by surveying people before implementation and then again after implementation. The group is also checking with other U.S. campuses with similar laws to see what data they collected before and after implementation. 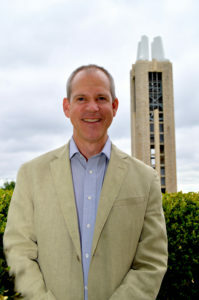 I’m the Journal-World’s KU and higher ed reporter. See all the newspaper’s KU coverage here. Reach me by email at sshepherd@ljworld.com, by phone at 832-7187, on Twitter @saramarieshep or via Facebook at Facebook.com/SaraShepherdNews.